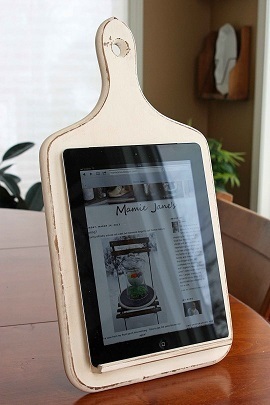 1) Kitchen Tablet Holder – For the person on your list always whipping up a new recipe, this simple and stylish tablet holder will keep every recipe within easy reach. Directions: Start by gluing a piece of wood on the front that will hold the tablet in place and a rectangle- or triangle-shaped piece on the back to keep the board upright on a kitchen counter. Once dry, you’ll paint the entire piece with chalk or spray paint in whatever color you’ve chosen. Both types of paint are forgiving and will allow you to cover up any imperfections or even pre-existing designs on your thrifted wooden tray. Once you’re project is dry, you can use sand paper to give it a distressed look on the edges. 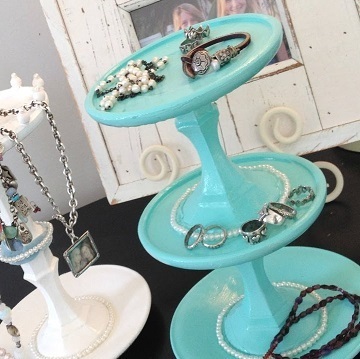 2) Jewelry Tray – Your friend that’s always changing up her accessories will appreciate a pretty organizer to store her treasures. Directions: For this project, you can either make one large strand or create several smaller pieces that work together and will look great displayed on a dresser or table. Take your time to find a good quality stand that feels solid. Metal and porcelain will work equally well. Choose a spray paint color that will give you the look you’re going for. A pewter color for your vintage loving friend, bright teal or pink for your tween niece or sparkly gold or black for your glam aunt. All you need to do is spray and let dry. If you want to use two contrasting colors, just tape off the areas close to where you’re spraying to avoid splatter. 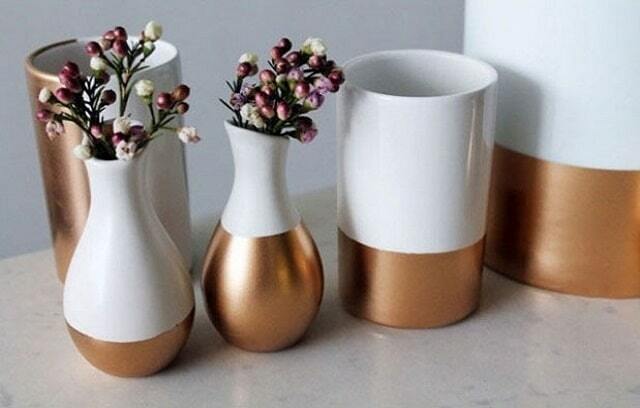 3) Dressed-Up Flower Vase – Don’t show up empty handed to any holiday gathering this season. Filled with fresh blooms, this DIY gift will serve as festive décor and a vase to be used year round. Goodwill items: Vases in any sizes you like. Glass or white are elegant but don’t be afraid to play around with fun colors and styles. Directions: Once you’ve chosen your vase, use blue painter’s tape to section of a design. The easiest and ultimately sleek design will be to paint the bottom, effectively hiding the flower stems to come. Get creative for a bigger impact – geometric designs, stripes, etc. Once you’re satisfied with your creation, spray away! Once dry, peel off the tape and voila! 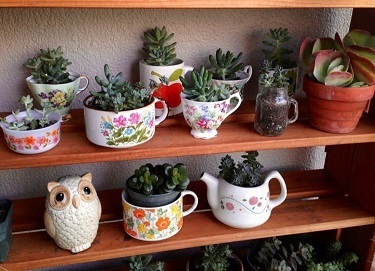 4) Shabby Chic Succulent Holders – Your green-thumbed friend will appreciate these adorable new additions to her collection. Goodwill items: Containers such as tea cups, old trophies or small pots. Directions: There are two directions you can take with this DIY project. Spend your time thrifting unique containers that stand as art on their own or use your creativity to create vessels that shine. We like spraying different shapes and sizes in one color to create a unique set. 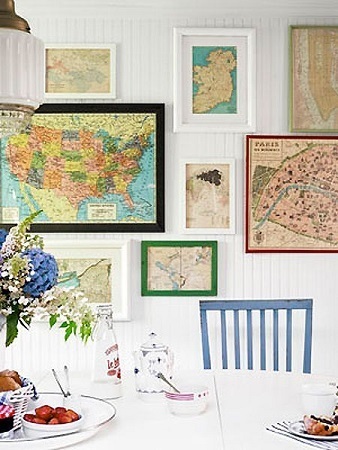 5) Framed Maps – For the person in your life who always seems to be jetting off to new destinations, framed map décor will allow them to continue their wanderlust while at home. Directions: Again, choose a color of spray paint for these depending on the look you’re going for. We like deep blues and greens that will complement the colors in the maps or go for gold-toned hues for a more regal look. Vintage maps are awesome if you can score them or pick them up online. These DIY gifts are a great way to lower your carbon footprint, save money and support your local community. 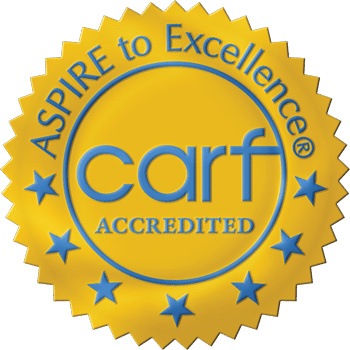 More than 90 cents of every dollar spent in our stores supports our mission of helping people achieve their full potential through the dignity and power of work. Happy thirfting and crafting!